Fancy decorating your car or your mobile phone? We have great frangipani accessories for both! 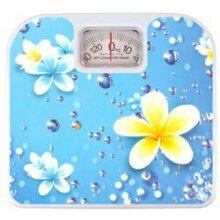 Or how about some funky Frangipani bathroom scales! 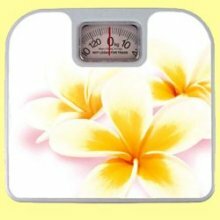 A classic set of bathroom scales, given a stylish, playful twist thanks to the Frangipani design that adorns it. Measuring in kilograms, the scales are simple, accurate and a perfect addition to any bathroom. Dimensions: (L)26cm (10.25") x (W)24cm (9.5") x (H)5cm (2"). Maximum weight: 130kg. Note: Please choose your colour before clicking "Add to Cart"
All stickers are vinyl based, full colour, high resolution prints using the latest technology in solvent ink printing, specifically made for long term outdoor applications. Solvent ink requires no lamination, and has a long term resistance to all weather conditions and UV exposure as well as giving a high quality print. These durable outdoor UV resistant waterproof vinyl stickers are designed in Australia by the Jantke Art Studio. This double frangipani set measures 96mm by 100mm (or 3.75" by 4"). Available in pink or white. 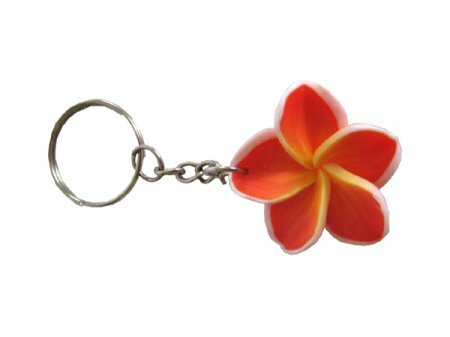 Note: Please choose your sticker colour before clicking "Add to Cart"
This double frangipani set measures 13.5cm by 18.5cm (or 5.3" by 7.3") and contains 1 double and 3 single frangipanis. Available in pink or white. This frangipani corner set measures 81mm by 108mm (or 3.25" by 4.25"). Available in pink only (end of stock line - for other colours see new design below). This large frangipani corner set measures 21cm by 30.5cm (or 12" by 8.2"). It contains 2 corner sets, one centre piece, and 2 single frangipanis. Currently available in pink & white or purple & white. This Frangipani Sticker Set contains 9 stickers measuring approx. 27mm to 85mm wide (or 1" to 3.25" wide). Available only in in pink (for white set see Singles Sticker Set below). This Frangipani Sticker Set measures 13.5cm by 18.5cm (or 5.3" by 7.3") and contains 5 stickers measuring 6cm by 5.5cm. Available in white. 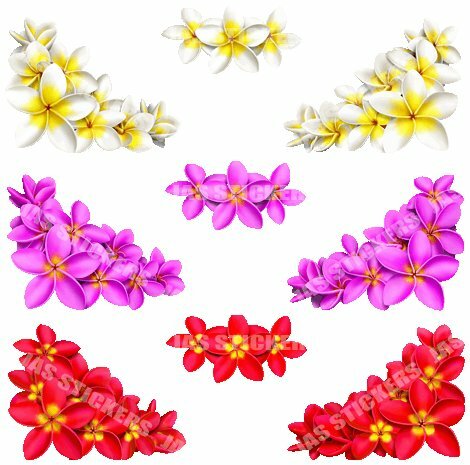 This Frangipani Sticker Set measures 21cm by 30.5cm (or 12" by 8.2") and contains 9 stickers measuring from 6cm by 7cm up to 10cm by 10cm. Available in white. This frangipani & dragonfly set contains 9 stickers measuring approx. 25mm to 70mm wide (or 1" to 2.5" wide). Available in white. This single large sticker is a frangipani & butterfly sticker. It measures 100mm to 110mm wide (or 4" by 4.5" wide). Available in white.